10 Keto Friendly Items For Your Shopping List - Profitness Guide! As expected, your new diet requires a great change in your grocery list as well. It’s time to lose the starch, carbs, and sugars, and make room for your new healthy keto-friendly items and start off your journey to health on the right foot! And while this journey requires you to bid some of your favorite foods up until now goodbye, you still won’t be at a loss. There is a wide selection of different food groups that you can indulge in instead. And of course, your meals wouldn’t be complete without a dessert, so make sure to get your free ebook on Konscious Keto, and start making the 15 most delicious keto desserts you can think of! From my personal experience, making a keto friendly meal is close to impossible without using coconut oil. Not only is it tastier than most oils you’ll come across, but it also has more benefits for you. From my personal experience, making a keto-friendly meal is close to impossible without using coconut oil. Not only is it tastier than most oils you’ll come across, but it also has more benefits for you. Coconut oil contains lots of medium-chain triglycerides (MCTs), which are fats that are taken directly to your liver once ingested, and then either immediately used as a fuel source, or rapidly converted into ketones. Who knew that tasty and healthy could go hand in hand? When it comes to shellfish, their carb count can greatly vary, but salmon and other fish have little-to-no carbs whatsoever, making fish the perfect keto choice for your meals! They are also rich in potassium, selenium and vitamin B. As for the shellfish, you will definitely want to add some clams, oysters, octopus or squid to your shopping list, but you should know their carb counts before you do. There is no surprise in the fact that you will want to stack up on veggies on your next grocery shopping trip, but not all vegetables are equally healthy. One thing to keep in mind is that almost all vegetables have a reasonably low carb count, but a single serving of some “starchy” counterparts such as potatoes could be well over your daily carb limit. Avocados are synonymous with keto-friendly, so they deserved their own category! They are high in minerals and vitamins, and the fact that about half of an avocado contains only 2 grams of net carbs makes them the perfect keto food! What’re more, avocados help stabilize triglyceride and cholesterol levels. There’s no argument that cheese is delicious, but did you know that it is also a great choice for our fellow keto dieters? Due to the fact that they are low in carbs and high in fats, the majority of cheeses you’ll come across will be just the perfect choice for your keto diet. Also, eating cheese regularly prevents muscle loss, which is great if you are already on an exercise regime! Since both are low in carbs and high in fats, nuts and seeds are a must-buy when you go grocery shopping next time. Just look at the carb count list below! Meat and poultry are the base of all ketogenic diets, so it’s no wonder that you have to stack up on both as soon as you get to your local grocery store. 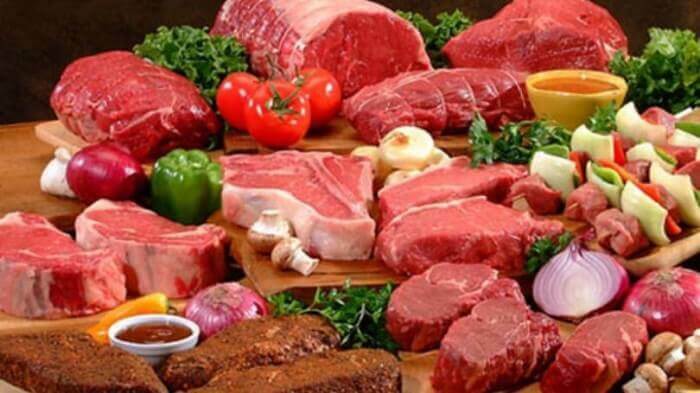 Make sure to get fresh meat whenever you can, because fresh meat has the lowest carb count. Although fruits are healthy and beneficial for you, they tend to be quite high in sugars, which is why your diet allows berries for the most part. They are rich in nutrients and even though they have a certain amount of carbs, those carbs are easily digestible, which makes them the perfect choice for a healthy snack! Not only are they tasty, but they also have anti-inflammatory properties and are rich in nutrients, which earns olives a spot in your shopping list! Dark chocolate is a great source of antioxidants. Tasty, healthy and keto-friendly — what more could you ask for? The only thing to keep in mind is that the dark chocolate of your choice should contain a minimum of 70 percent cocoa solids, and you’re good to go! There you have it, your shopping list appears to be finished. If you are curious about foods that have not made it to the “Top 10” and whether they are keto-friendly, you will find everything you need to know here. Happy dieting!